Works alongside every major antivirus. Compatible with all major web browsers. Available on Windows, Mac OS, iPhone and Android. Sick of ads following you around the web? It's more than a nuisance. The ads are just the tip of the iceberg, there's a larger, invisible threat you can't see. It's not a conspiracy. For years companies have been secretly monitoring nearly everything you do online, selling and sharing YOUR whereabouts and activity to gradually influence your daily life and decisions. In today's world of data breaches and identity fraud, there's a whole new risk you need to know about. Modern tracking threats—also called digital fingerprinting—allow data miners to steal information about your family (age, religion, work and school), your finances (income, debt, credit, loans, bank accounts), web history (articles, videos, shopping). The ID thieves know where the information is stored, and they want it. Bad. Don't take our word for it. Try our free online scan to see just some of the tracks you leave behind. Enjoy peace of mind online. Finally. fingerprint that's used to identify and track you. TrackOFF works like a glove to protect it. Hard-to-remove tracking cookies tell the story of who you are and where you've been. TrackOFF blasts them away in seconds. Ever wonder who's following you online? 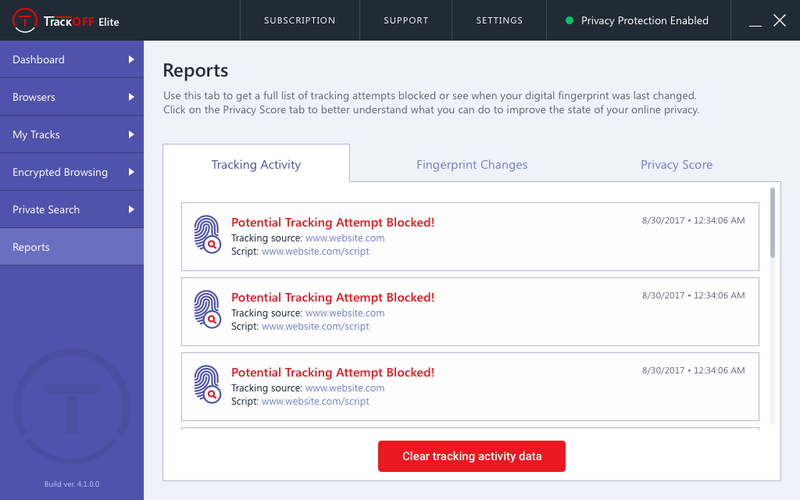 TrackOFF shows you a list of every website trying to scoop up your info. Your computer's IP Address reveals your location to marketers and advertisers. TrackOFF's VPN stops them from knowing where you are. State-of-the-art technology identifies attempts to collect your personal, family, medical, and financial data. Don't have time to manually erase your browsing history? No worries! Set it and forget it with easy removal. With DuckDuckGo, you can perform searches with peace of mind that they'll never be logged. A no-hassle configuration means that you're protected in minutes. 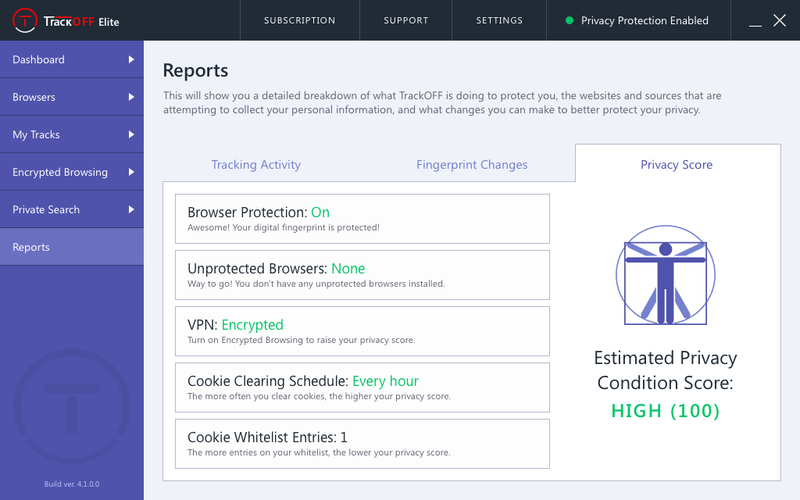 TrackOFF knows which browsers are on your computer and enables protection. Some software blocks essential elements of webpages. TrackOFF allows the good and stops the bad. We believe in true privacy online, which means we'll never collect or sell your personal information. An easy-to-use, lightweight application that works in the background when you want, but still packs a punch. Our dashboard gives you a snapshot of the privacy threats we've prevented, as well as statistics on how well you're being protected. 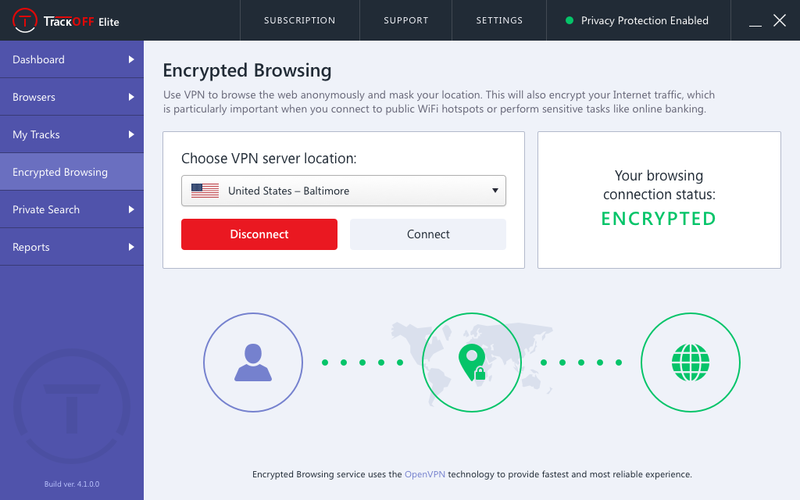 Other VPN software is confusing. Ours is simple. Activate it with one click to encrypt your browsing and mask your location. Cookies tell the story of who you are and where you've been online. Easily remove them to get rid of targeted ads. Or set a schedule, and TrackOFF will remove them for you. Most search engines collect, store, and share your data. 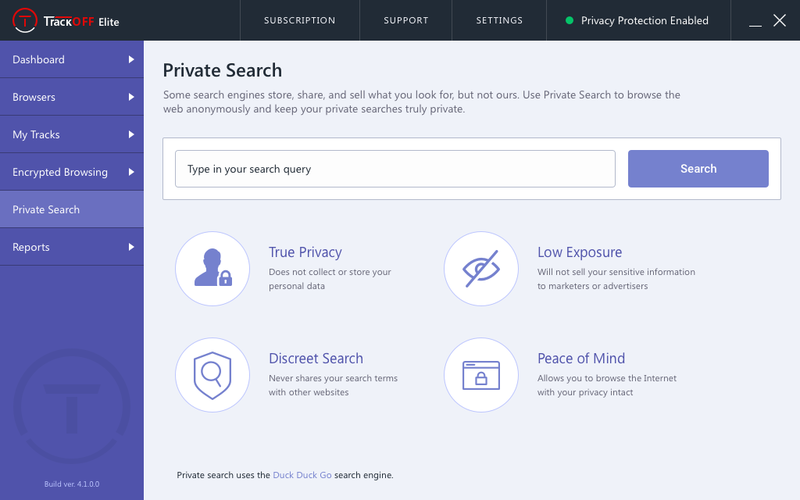 TrackOFF uses the DuckDuckGo search engine, where searches are truly private. 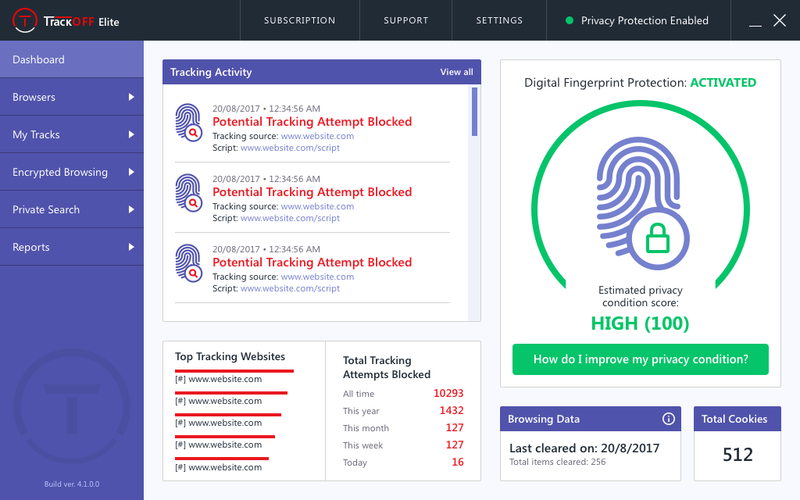 Get a full list of tracking attempts blocked or see when your digital fingerprint was last changed. Provides a quick and easy way to determine if your software is configured and running properly. The score is affected by TrackOFF's various privacy tools and settings. 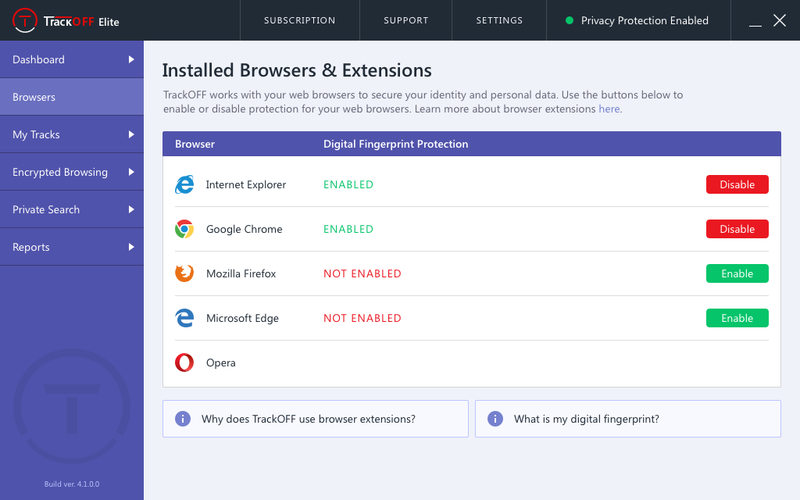 TrackOFF integrates seamlessly with your favorite web browsers for fingerprint-based protection. One click away from clearing your fingerprint data history. 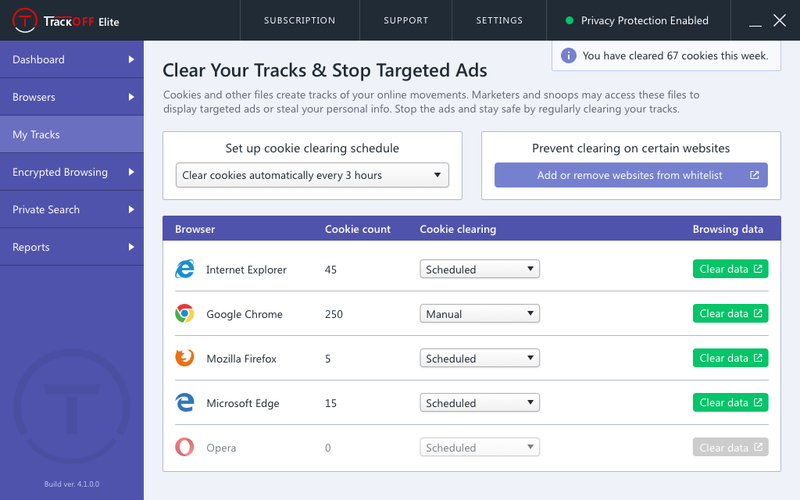 Antivirus, VPN, incognito mode, and ad-blockers won't stop the trackers. See why your current protection isn't enough. Antivirus protects your computer. We protect you. "TrackOFF won't protect you from ransomware, or keep viruses out of your system. It's laser-focused on protecting your privacy. You can use it for mundane tasks like clearing cookies or deleting browser data, and you can launch anonymous searches from within the application. But the heart of the product is its ability to foil attempts to track you based on your browser fingerprint, a unique technology that I haven't seen in any other products." "TrackOFF is a simple yet highly efficient application devoted to protecting your computer from any unwanted visitor attempting to steal your most valuable information. It will not only protect your browsers and your browsing experience but will also alert to stop any privacy attack trying to compromise your security." "This utility won't conflict with any existing antivirus programs you may have on your computer. It is actually encouraged to use it in tandem with with an antivirus program or with a VPN client." "The software was easy to load and the support was very helpful and knowledgeable. I only called to ensure I set the settings to its highest protection. I'm loving it. I can look on the dashboard and see how many sites are trying to track my computers. I really appreciate the software and I really appreciate the representative of TrackOff that emailed me to thank me for my purchase and offer me further assistance in the future. I have had a wonderful experience with the TrackOff software and their personnel." "I purchased TrackOFF about 6 months ago and I'm very happy with the product. After I've been shopping I go to Facebook and don't find what I just purchased to be advertised there. TrackOFF does this job and is very easy to install. 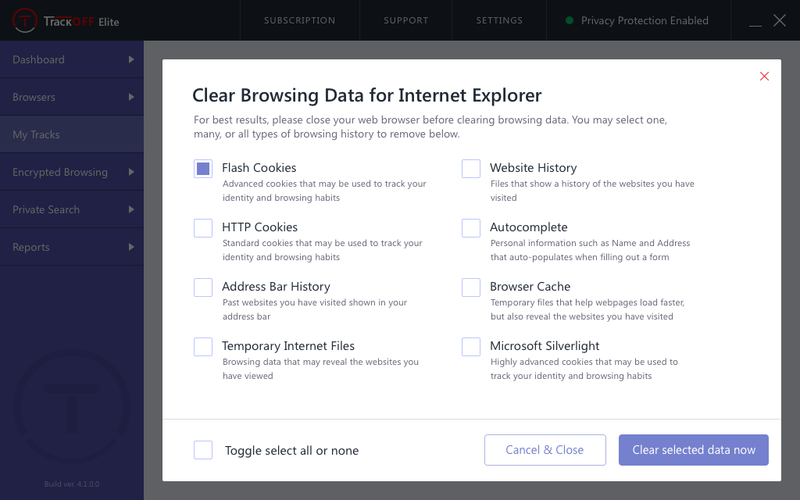 You can erase your browsing data from all of your browsers and clear all of your cookies in a matter of seconds. I recommend this product to everyone who does not like to be tracked when they go online. Keep up the good work TrackOFF! I will be a forever customer." "I bought your product mainly for the vpn and it works wonderfully without throttling my download or streaming speeds! I will be renewing the subscription next year." "I find the VPN most helpful, I mainly use it when I'm with another Wi-Fi connection or logging into my bank app, it gives me a good mind set that I don't have to worry about anything or anyone getting my info. Also no more ads ??. With the step by step guides I understood everything. I love it. Did not have too many complications, and it was easy to use." Enjoy all the great features of TrackOFF Standard. In addition, browse anonymously by enabling VPN with one click. Mask your real location, unlock restricted websites and enjoy the complete safety. Already have an activation key? Click on a link below to download the latest installer for our desktop applications. What is my Digital Fingerprint? © 2019 TrackOFF, Inc. All rights reserved.